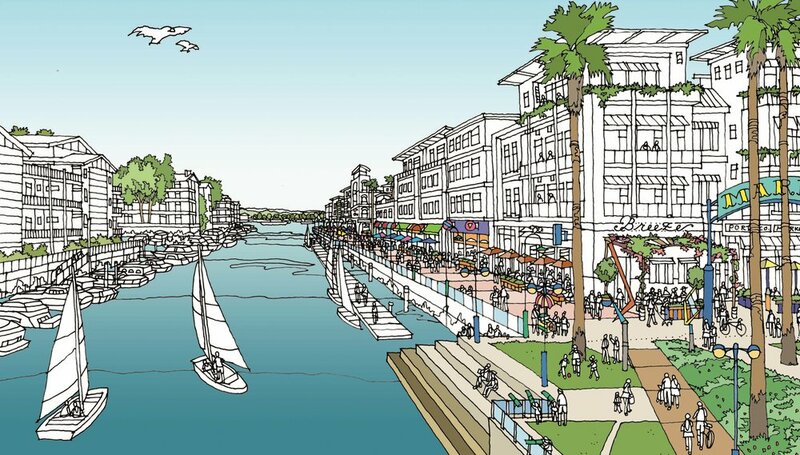 Cityworks Design provided urban design leadership on the development and design standards for the southeast neighborhoods of Long Beach as a consultant to Placeworks. Cityworks Design contributed framework ideas, streetscape designs, site feasibility studies, height and setback illustrations and architectural design guidelines that aim to achieve a sustainable, walkable and bikeable community of mixed use development. Lisa Padilla facilitated urban design discussions at community advisory committee meetings and at several public open houses. The design guidelines that resulted are designed to be used by the community, staff, developers and architects. Cityworks Design led the urban design work for the Downtown Plan as a consultant to AECOM. Adopted in 2012, this plan established a vision, development standards and design guidelines for the vibrant Downtown neighborhoods of Long Beach. Cityworks Design created architectural standards and guidelines, illustrations, modeling and authored key sections of the plan in collaboration with AECOM and city planning staff. It serves as a guiding document to encourage new development that contributes to more transit-oriented and walkable communities. Cityworks Design contributed to concepts and products for the land use and urban design elements over the course of several years. The firm's contributions included urban design principles, placemaking concepts, illustrations and renderings to support city planning staff's vision for the updated general plan. Lisa participated in community workshops designed to engage city residents of all ages during the early planning process.